The Republican frontrunner assigned words and phrases to potential VP candidates. Mitt Romney sat down with Jay Leno on Monday's edition of "The Tonight Show" to play a game of Republican word association. When GOP frontrunner Mitt Romney sat down with Jay Leno on Monday's episode of "The Tonight Show," the late-night host asked the former Massachusetts governor if his campaign has settled on a pick for the VP slot. Gov. Romney, who has yet to definitively lock up the Republican nomination, didn't want to get ahead of himself. "I haven't actually put a list together at this stage," Romney said. "It would be presumptuous." But that didn't stop the presumptive ticket-topper from obliging Leno's request for a rousing game of GOP word association—Vice Presidential edition. "Give me one word on each person," Leno said, before launching into a shortlist of GOP politicians whose names and CVs have been floated by pundits throughout the long-fought nomination battle. "How about a couple of words, maybe?" Romney proposed. Check out the clip below (starting at the 03:40 mark) for the choice adjectives and phrases Romney used to describe New Jersey governor Chris Christie, U.S. Senator Marco Rubio, Wisconsin congressman Paul Ryan, South Carolina governor Nikki Haley, and Donald Trump. 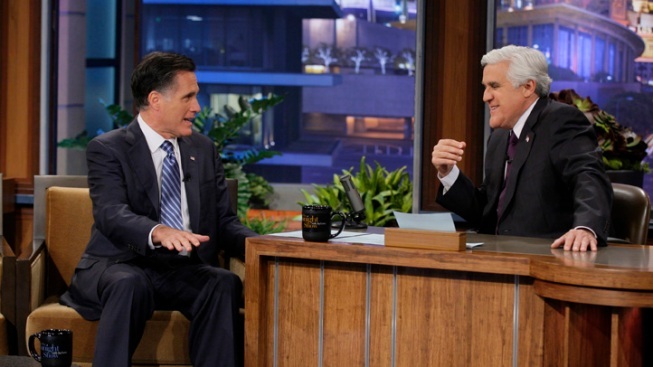 Of course, Leno couldn't resist including Romney's closest rival. "Press secretary," Romney said with a grin.